You are here: Home > Frequently Asked Questions about Bamboo Boards, Plywood Panels & Bamboo Flooring > How Green is Bamboo – REALLY? How Green is Bamboo – REALLY? Okay, nowadays everybody says they are “GREEN”. But are they REALLY “Green”, or is it just a marketing spin? Bamboo is a green source, Eco-Logic Bamboo products are green! The statement above is a common type of claim, but is it true? Whilst there are many differing opinions about what makes something “green” or environmentally friendly, determining the true “greenness” of any product is not always as simple as it may sound. This topic can get very technical and complicated really quickly. Often, when the scientists (marketers and politicians) start talking about “Green”, they loose most of us by the third sentence. Various organisations have come up with different ways of checking the greenness of products; including “Cradle to Grave” & “Cradle to Cradle”. It is not our goal to explore the depths or merits of any particular methodology or even claim to have any real expertise in these towers of knowledge. Rather we ‘ll merely attempt to highlight important information that one requires when deciding on the merits of Eco-Logic Bamboo‘s “green” credentials. Environmental issues are becoming a major world topic, and the construction industry’s environmental performance is coming under close scrutiny particularly with regard to the availability and sustainability of certain materials, and the extraction of the large quantities needed to meet the needs and aspirations of the global community. For those of you who are confused by all the “Green” opinions out there, if you hang in and work your way through this post, you’ll get some real world commentary for your consideration. This will help you when deciding if our Eco-Logic bamboo (or any other built industry product) is really a suitably green product for your application and when comparing its’ credentials to other products. This post – due to it’s very nature, is destined to be a slightly long-ish one, so we suggest you fetch a cup of your favorite drink & settle into a comfortable spot. Please keep in mind that this topic is an emotive one, bound to stir up all kinds of controversies, so we have tried to stick as close to scientific studies and established facts as possible to keep the temperature down as much as possible. It is also a commercial one, decisions around topics like this can affect purchasing choices and ultimately someones pocket. And that someone is going to fight tooth & nail to protect that income, it can get real messy. Are you a decision maker? Making decisions about specifying green products in the built environment? So, if you are a decision maker, making choices as to which products to specify & which products not to, we consider this post an essential read. It is important that you make an as informed decision as possible. We hope to stimulate and provoke serious and careful considerations of the issues at stake here. Why is bamboo generally considered “green”? Significant aspects of the “greenness” of a product revolve around the whether the product is derived in a sustainable, renewable way. Bamboo is the fastest growing plant on earth. This fast growth means it sequesters more carbon than slower-growing trees. 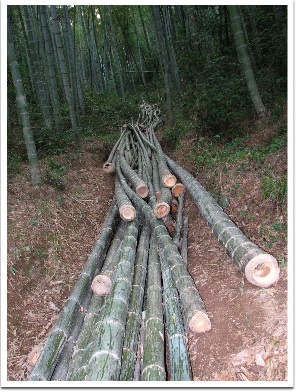 It takes only 5 years for a Phyllostachys pubescens (Mao-Zhu, or more commonly called Moso by Westerners) bamboo pole to reach the maturity required for use in flooring and board manufacturing. For this reason, Bamboo is considered a rapidly renewable and sustainable resource. Bamboo has a rhizome root system, so when a bamboo tree is harvested (at maturity) it is actually a good thing for the plant – and the real big bonus – the root system just sends up another shoot in it’s place. There is therefore no need to replant a harvested tree. These attributes make it a top class sustainable and rapidly renewable resource. What are the arguments against bamboo being considered “green”? Harvesting is performed in an unsustainable manner. Since production is largely from natural forests, demand has outstripped the annual incremental production capacity of the forests. This has resulted in issues such as replacing natural forests with bamboo plantations, thus creating a monoculture. It has also resulted in the use of fertilizers and pesticides being introduced. The distance between the factories & consumer markets. The amount of energy required to process the raw bamboo into a finished product. We address each of these issues in detail as you work your way through this post. So the question begs; are bamboo timber products (boards, plywood, panels flooring and doors) really green, considering the arguments against? Our answer is that bamboo is a “green” material by definition, but that certain factors impact the greenness of the finished products. So, in the case of Eco-Logic Bamboo, our answer is; Eco-Logic Bamboo Flooring & Board products are CERTIFIABLY green. We suggest you evaluate other bamboo suppliers based on their CERTIFIED & verified green credentials (there is a lot of marketing hype out there). Our factories source raw materials from FSC Pure sources. Our Eco-Logic Bamboo flooring Formaldehyde emissions are externally tested by SGS & rated as “ND- Not Detectable“. Eco-Logic Bamboo boards and plywood panels hold a E0 certification by SGS. FSC – stands for Forestry Stewardship Council. This is a non-profit organisation that have written up a bunch of standards that effectively protect our natural forests and the things reliant on them. If an organisation subscribes to their rules, they are subjected to an external certification process by an independent 3rd party to see if they meet the strict standards upheld by the FSC. This is pretty difficult – don’t believe us, go and Google “FSC bamboo” and see how many bamboo flooring & bamboo board suppliers actually supply FSC rated products. We have a more in depth post on FSC here. ISO 14001 – International standards to which a factory can be externally certified as compliant, wherein they subscribe to green manufacturing processes. In other words, their manufacturing practices are certified to take the environmental impact into consideration. A good thing, as we don’t want the factory to be spewing out all kinds of environmentally damaging goop into rivers, earth and sky (whilst the retailers tell you the product is green). Formaldehyde – this is a very common component of glues used in all kinds of goods. This product affects the Indoor Environment (air) Quality (known as IEQ by the boffins). You know the “new” smell you get when you walk into a room that has just been carpeted? How about that “new” smell in that brand new kitchen you had installed (that is made from pressed boards with those exotic wood veneers)? THAT “new” smell is most likely Formaldehyde – a known carcinogen (cancer causing substance). Scary isn’t it? Points 3 & 4 above tells you that other external organisations agree with our green claims – why? Because they have independently tested and verified that we’re not talking nonsense or just spinning a marketing yarn (as many others do). That said, let’s move onto the “demand side” (how it gets to your door) arguments against bamboo’s greenness, we address each issue separately. In order to address the following two questions on carbon footprint & embodied energy, we have used this study, comparing locally sourced concrete to bamboo flooring, as the basis of our answers. Unfortunately the study is full of the usual jargon & acronyms bandied about by the professionals who perform these kinds of studies, so we’ve tried our best to pull out the important bits for you. The study compares the amount of embodied energy inherent in imported bamboo flooring and compares this to that of locally sourced concrete. We have adjusted the numbers in the study, updated in the table below, to reflect more accurately on South African conditions. Obviously concrete & bamboo flooring are not generally considered to be directly competing products (actually they are), but the study does serve to illustrate relevant points for consideration. All things considered, locally sourced is generally better. Transport is one of the biggest producers of CO2 emissions (CO2e). So the Carbon Footprint of any product that is transported (or mined or harvested using machines) must be evaluated. When comparing bamboo flooring to locally sourced concrete, the bamboo flooring emits 17% less CO2 per ton than the equivalent amount of locally sourced concrete. So it can be seen that bamboo flooring, when compared to concrete (in this study), even though it has to travel such a long distance, compares favourably in terms of CO2e. The main reason for this is that transport by ship (the majority of the distance traveled), is the most CO2e efficient means of transporting bulk materials. Bamboo is the fastest growing plant on earth, producing 30% more oxygen than a hardwood forest of similar size. Bamboo, whilst producing this much oxygen, absorbs up to 12 tons of carbon dioxide per hectare, making it more efficient than hardwood trees. Bamboo increases its biomass by 10-30% per year, which far exceeds that of trees, which is 2-5% annually. Bamboo improves watersheds, prevents soil erosion, and removes toxins (heavy metals – often caused by polluting factories) from contaminated soils and water. Bamboo can be fully recycled. When one factors in the contributions of bamboo in the full Cradle to Cradle scenario. Plus the factoring in of the additional CO2e emissions generated in the rehabilitation of the quarries (not considered in this study), we expect the the CO2e advantage of bamboo over concrete, as per this study will be greater than the calculated 17%. Manufacturing & transport contribute to the embodied energy of a product. In the above study comparing locally sourced concrete to bamboo flooring, we can see that the bamboo flooring contains 31% more embodied energy than locally sourced concrete. The major contributor of the embodied energy being the transport. However, the study does not take into consideration the positive effects bamboo in general has on reversing negative environmental impacts and the commensurate negation of this embodied energy, nor the longer term negative affects that quarries have on the environment. This would need to be considered in the context of a Cradle to Cradle evaluation. The study does not include the embodied energy & CO2e taken to rehabilitate the quarries, or the environmental impact between commencement of mining to total rehabilitation (if any actually takes place). This is obviously something that is significantly difficult to measure. But should be included in the evaluation. Bamboo is a natural water control barrier. With its widespread root system and large canopy, bamboo greatly reduces rain run off, prevents massive soil erosion, and keeps twice as much water in a watershed. Bamboo has a very high water use efficiency, double that of any tree species. No strip harvesting either, as trees of various maturity are located right next to each other. There is no need for CO2e spewing harvesting machinery – the trees are harvested using machetes. There is no need for irrigation. Bamboo root systems can protect steep banks from erosion. On the other hand, quarries exacerbate or are often the cause of the many of these ecologically negative issues that bamboo helps prevent or improves. We have to ask this question: what effect does rehabilitation have on decreasing the gap between the embodied energy of locally sourced concrete vs bamboo flooring? And how much does it increase the gap between the CO2 emissions? A case in point; there was a big “Save Chapman’s Peak” campaign in Cape Town a number of years back. A company wanted to mine the back of Chapman’s Peak for Kaolin, after a big too’ing & fro’ing the mining was eventually allowed. However, the company had to close operations after mining the site for a few years due to a drop in the demand for it’s Kaolin. So will Chapman’s Peak ever be rehabilitated? Someone has to pay to rehabilitate the mine, and what will the carbon footprint and other environmental impacts be if and when it is rehabilitated? When one considers the contributions of bamboo in the full Cradle to Cradle scenario, and the additional embodied energy impact of rehabilitating the quarries, we expect that the embodied energy advantage of locally sourced concrete over bamboo, as per this study, will be reduced to significantly less than the calculated 31%. Possibly even completely negating the advantage locally sourced concrete currently has over bamboo flooring. So what about locally sourced alternatives? In general, it is true that “locally sourced” may well reduce the contribution of transport to the overall carbon footprint. It is however important to check the carbon footprint and embodied energy of locally manufactured alternatives:- they may not offer the required advantages at all. There are many suppliers jumping on the “our product is green” bandwagon. But many of these products are not as green as they would have you believe. The industry term for this is called “green washing“. How much electricity is involved in manufacturing said product (or it’s sub-components)? Coal fired power stations (most common in SA), are responsible for huge amounts of CO2e. This reliance often completely negates the “it comes from far away” argument. Can the manufacturer produce externally audited & verified evaluations of the impact the manufacturing of the product (and it’s sub-components) has on the environment? If it is a product produced from forests, is there, and if so, an FSC CoC in place? What about the factory, does it consider the impact it’s production processes have on the environment? ISO 14001 certification goes a long way into addressing these types of questions, so do they have ISO14001 certification? Is it dug out of the ground? Using industrial machinery? If so, the carbon footprint of these machines is significant, has this been considered? Are the raw materials renewable? Rapidly renewable? Is the consumption of the raw materials sustainable? Is rehabilitation of the source required? What will the CO2e & embodied energy of the rehabilitation contribute to the footprint of the product? What is the ecological impact of the consumption of the raw materials and the manufacturing processes? If these answers are not forthcoming, or cannot be answered definitively, then is locally sourced really the first prize? As a specifier, specifying certified green products, you need to look at how many CERTIFIED “green” tick boxes are actually being ticked when deciding. In terms of the local labour considerations (often brought into the arguments against – this is primarily a social issue, not an environmental one); bamboo boards are essentially a “raw material”. Many joiners, cabinet makers, kitchen, cupboard & furniture manufacturers use local labour to produce their end products. The few locally produced solid wood flooring products are still largely manufactured from foreign timber sources. What then of the “how it is grown arguments against”? Whilst this statement is true in some cases, it is really a “throw the baby out with the bathwater” type statement. In practice this statement is not nearly as far reaching as it implies. This statement is usually referring to practices such as strip harvesting and cutting down natural forests to make way for bamboo plantations (“…’cos that’s were the money is”). Also, this statement is largely untrue for Phyllostachys pubescens, (also known as Mao-Zhu or [mis-pronounced & marketed in the West as Moso] the species mostly used for architectural bamboo products and mostly refers to bamboo species grown for food. In the late 1990’s (29th April 1998) the Chinese government reformed their forestry policies, largely putting paid to many of the bad practices. In fact, the opposite is true; China’s National Forest Restoration Program has a planned afforestation of 4 million hectares annually. In 2007 the forest area in China grew by 5.196 million hectares. During 2008, they planted more than 2.5 billion trees covering 5.29 million hectares. In 2009, this program has seen an additional 2.6 billion trees planted, covering about 5.412 million hectares. As you can see that they are exceeding their target every year. As you know environmental projects should include local communities to be really effective. China partly achieves these goals by including their local population by requiring the active practice of a compulsory tree-planting as part of their program. In 1981, the National People’s congress decided that every citizen above 11 years old, except the weak, old, sick and disabled, should plant 3-5 trees every year, or participate in the cultivation of seedling and seeds, tree maintenance, or other afforestation tasks. A very practical way of getting people involved. The way bamboo is mostly harvested is intrinsically green. Most of the bamboo, Phyllostachys pubescens — known as Mao Zhu in China & Moso in Japan, used in bamboo flooring and board products, occurs in forests on the mountains of South East China. Due to the mountainous nature, mass or mechanical harvesting is largely impractical. Also, bamboo has a rhizome root system – this means that trees of varying ages occur right next to each other – so the bad practise of strip harvesting is generally not practical. Bamboo trees are selected according to maturity and then cut down using a machete. The use of fertilizers & pesticides is not an issue in the case of Eco-Logic Bamboo products, as our forests are certified FSC Pure. If you are buying from another supplier, this issue is a major a factor to consider. Another “negative” often quoted, is that natural forests are cleared and replaced with bamboo. As stated above, the Chinese government reformed its forestry policy, essentially preventing this practise. The argument is therefore a mute point. Eco-Logic Bamboo products are sourced in FSC Pure: Product groups manufactured with 100 % FSC-certified material, sourced in certified forests & sustainably managed according to certified ISO 14001 Environmental Standards. You can read more about Eco-Logic Bamboo’s green credential on this page. What happens when your project requires timber in some form for finishes (very common), what are the local alternatives? In the case of bamboo boards, your alternatives are either solid woods or pressed boards & forget the exotic wood veneers, they come from far away. From a floor covering perspective, true green options are very limited. No matter how you look at it, your options are greatly diminished when you insist on locally sourced only. that is FSC certified (Pine, Eucalyptis? – there is a lobby against certifying SA plantations as FSC forests & South Africa only has natural indigenous timber reserves of just 2,999 square km). and you use a significant amount in your project. You score a best case scenario of a weighted 4 Green Points. But what about Indoor Environment Quality (IEQ), will the local supplier be able to offer you a product that meets the GBCSA IEQ requirements? If not, given everything else being equal, the use of bamboo flooring & boards would gain you an additional 2 Green Points for IEQ, equaling the points not achieved by local sourcing. BUT, Eco-Logic Bamboo gives you a technically superior option that is sustainable and rapidly renewable with it’s 5 year harvesting cycle (vs 11+ years for FSC certified local timbers). From a carbon footprint perspective, there is no comparison when comparing the benefits of bamboo to other solid woods; bamboo is superior in all the green aspects, and very compelling when comparing the technical aspects. A large percentage of solid timbers used in South Africa are imported from places such as South America, North America, Central Africa, Australia, New Zealand and Malaysia. This effectively negates the locally sourced aspect. If you need to use wood (and heaven forbid – you use a plastic option) – bamboo is a clearly a better option – THE ideal WOOD REPLACEMENT product. 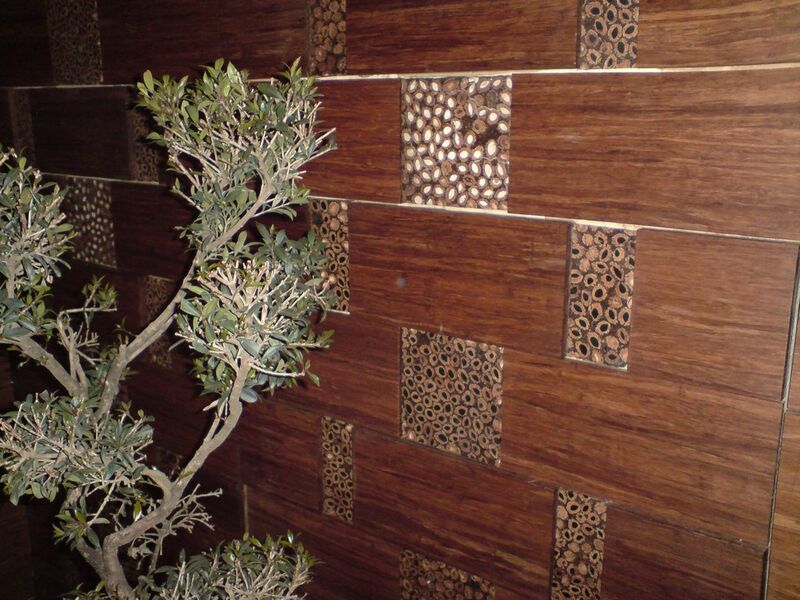 Pressed boards vs bamboo boards – the only real advantage is price and even that becomes debatable when your specification requires an exotic veneer on a top quality HDF pressed board. In virtually all other aspects, specifically with regard to indoor air quality & moisture tolerance, bamboo boards are an excellent option. What about floor coverings – tiles, ceramics, laminated flooring, carpets, resilient flooring (many of these products are manufactured in distant lands as well – especially the high quality ones). Each has it’s place, but bamboo flooring excels when compared from a green perspective (and can certainly more that hold it’s own from a technical perspective). Counter tops – bamboo counter tops are a great alternative to granite & marble (both not renewable or sustainable) plus they’re cheaper. Furniture, BIC’s & structural carcasses – technically, bamboo flat boards completely outshine MDF & HDF and cost wise, compare very favourably to solid wood competitors (whilst in many aspects, outshining them technically). Cladding & Ceilings – with the rich grain of strand woven bamboo or the stain-ability of solid bamboo boards, the options are endless. 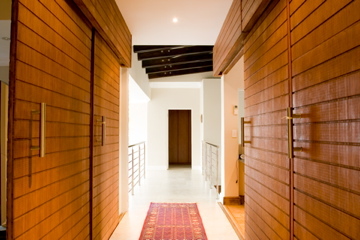 Doors – internal and external. Eco-Logic Bamboo boards & flooring can be considered a “green” timber replacement. We cannot vouch for other suppliers, but we do suggest you evaluate their advertised green credentials. So, if your project makes use of any timber, or your current products are not giving you the green points required, we suggest you be careful not to “throw the baby out with the bath water” when a comment like “bamboo is not green because it has to be transported far” is tossed in as an objection. Even though Eco-Logic Bamboo flooring & boards are imported, they are still a great sustainable and rapidly renewable + technically superior option and still compare very well to many locally sourced alternatives – all things considered. When evaluating which products to specify in your next project, one should be cautious not to zone in on one or two seemingly negative factors, but rather consider as many contributing factors as possible, as would be done in a Cradle to Cradle evaluation, before making your decision. We believe that the case for the green credentials of Eco-Logic Bamboo flooring and boards remains a very strong one.